Writing a great story is hard. Every author worth his or her salt knows this from painful experience. And if you’re setting out to write something worthwhile, you’re going to encounter failure along the way. But that doesn’t mean you’re a failed writer. Despite the temptation to give up or run away from writing again, you have to keep going. You have to keep writing. Because the reward waiting for you is priceless. Not only that, the reward can only come from failure. And it’s the ingredient that will make your story a must-read. It’s easy after a disappointing moment to want to give up. After placing second in a writing contest two years ago, I haven’t been able to win any more contests since. While a part of me feels like a failure, or a victim of rejection, another part of me is happy to move on from contests and all the emotions that go with them. In essence, failure is a choice. It is submission. And great writers refuse to submit even when they’ve been beaten down by the discouraging chapters of life. So define those moments you might think of as “failures,” those times you’re tempted to think you’re a failed writer, as something much more helpful, like a teachable moment, an obstacle, or — my favorite — a challenge. When viewed through the prism of opportunity, failure begins to look benign, even appetizing. This is especially true if you are trying to build a career in writing but aren’t “there” yet. If you’re anything like me, you spend forty or more hours a week at an exhausting day job, then go home to a family that loves and needs you for many of the remaining hours of that week. Finding time to write is a monumental struggle, so you would prefer that the words you write during that precious time be perfect. I’ve written many stories and chapters in those rare hours, and upon completion I hoped in my heart that they were ready for publication now. But upon receiving criticism or rejection, I’ve collapsed and wanted to abandon each project in kind. The cycle requires immense patience. Therefore, to grow in your patience, alter your expectations. Despite the narrow amount of time you may have to write, expect that what you’re creating will need to be revised. Know that it will be flawed in ways you can’t currently see. But trust that when the time comes to revise, you will be grateful for having written it in the first place! In The Story Grid, Coyne writes about patience as he teaches about one of the most powerful elements of a readable book: Controlling Idea and Theme. Yet this element of story isn’t like others that I’ve written about, like genre, objects of desire, and point of view. It is the fruit of long-lasting, committed labor. “Most writers don’t have a clue what their theme is until far into the writing process,” Coyne says. Yet a story without a theme, or uniting idea, wouldn’t really work, or even be a story. It would just be a jumbled assembly of events and words. A story must be glued together by a central purpose. But the beauty of this is the author need not know about it for it to be there. Coyne writes about one of his clients, playwright David Mamet, insisting that he writes without concern for such a central idea. Yet those ideas abound in Mamet’s work and make his work as revered as it is. This is why patience and persistence are so important for writers. You can’t give up when things go sour. You can’t believe the negative thoughts that come your way. Because persistence produces powerful stories. Refusing to give up after “failure” isn’t just important for you as a writer; it’s essential for your Story! The reward of proper expectations and patience is a central idea for your Story, born from countless hours of chiseling your Story out of the bedrock of the imagination. Your Story will be imbued with immortal principles tied to the very fabric of humanity. And that’s what readers crave. That alone is worth every misstep along the way. Whether you’re thinking of starting your first novel, or you have five half-finished manuscripts scattered across your office, you can’t give up. You’re not a failed writer. All of this work, this struggle, this creative suffering serves a powerful purpose: It tells a Story that you and your reader will love. A shift in expectations must be required. Our “instant gratification” culture conditions us to expect immediate positive feedback, thumbs pointing up, and likes. We see any negativity as an attack, or as proof of our deep, innate shortcomings. You can’t see it that way. It’s how we learn, grow, and become great at our craft. So no matter what your goals are this week, or for 2019, commit to persevering through failure and viewing it as an opportunity to strive for greatness. And when you look back, perhaps this will be the moment when you became the writer you’ve always wanted to be. Can you remember times when you felt like a failed writer? How did you overcome them? Let us know in the comments. Stories are about problems, and watching characters struggle through failures and overcome gives us hope. Today, pour out any feelings of failure, of disappointment, of discouragement that you have about your writing and give them to your characters. Write about a character at their lowest low, reconing with the realization that they’ve failed. What was their goal? Why are they so convinced now that they’ll never achieve it? And what note of hope will they discover at the end of the scene that reveals there just might be a way forward? Take fifteen minutes to write. When you’re done, share your scene in the comments below, and be sure to leave feedback for your fellow writers! 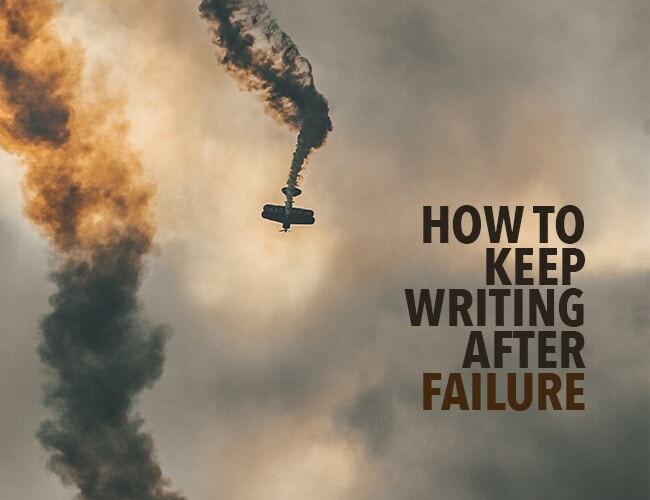 The post How to Keep Writing After Failure appeared first on The Write Practice.